For a while I wasn’t sure what to call this game. A string of characters I can’t read is problematic, even in the privacy of my head. Fortunately, I found an answer while clearing out my hard drive. 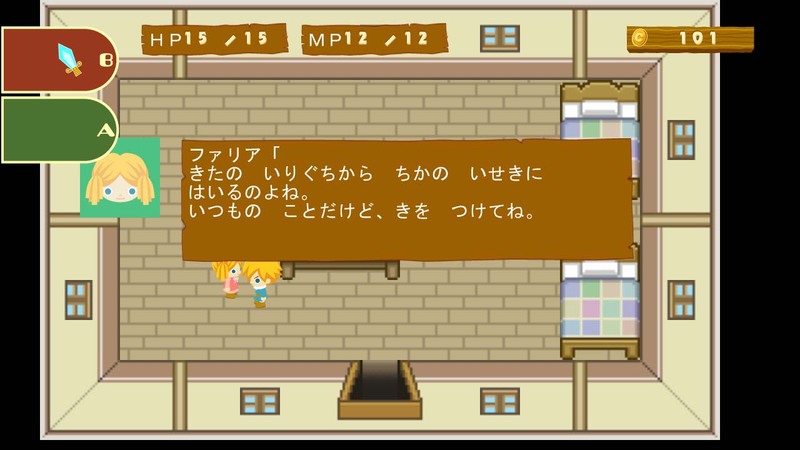 Though officially titled フェナックむら　ものがたり this game’s save data is labelled FenackStory, so that’s what I’m going with. 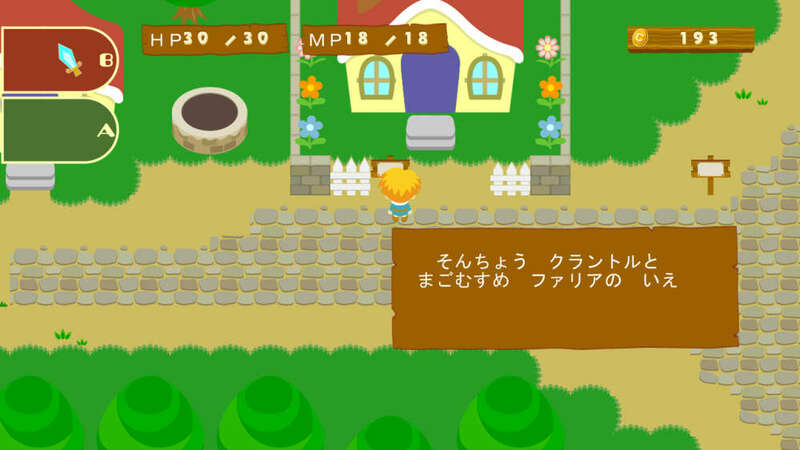 FenackStory is one of the handful of Japanese-only Xbox indie games. I gather from an assortment of hazily-remembered sources that Microsoft’s console gaming colossus is more of a yappy little terrier in Japan. There are some good articles out there on the impenetrability of Japan to western games, and the Xbox seems to have fallen foul of that. The console just doesn’t sell very well there, and as a result there aren’t very many games in Japanese on the indie channel. One particularly idle evening, I was craving a fix of a Zelda-like top-down adventure game, and I thought Japan was the most likely source for one. Thanks to its box art of a character who looked like Link if he’d been drawn hastily in MS Paint, FenackStory got my attention. My initial assumption was broadly right. This game wears its Zelda aspirations not only on its sleeve but all over its face. If influences were clothes, FenackStory would be wearing a Legend of Zelda t-shirt, carrying a triforce-shaped wallet in the pocket of its Goron brand jeans, and hiding its own forgettable facial features behind a creepy Link mask. I think she's saying "It's dangerous to go alone. Take this." Don’t get me wrong. While FenackStory‘s role model is obvious, it succeeds perfectly well at doing what it sets out to: being a low budget Zelda clone that will set you back a mere 80 Microsoft points. 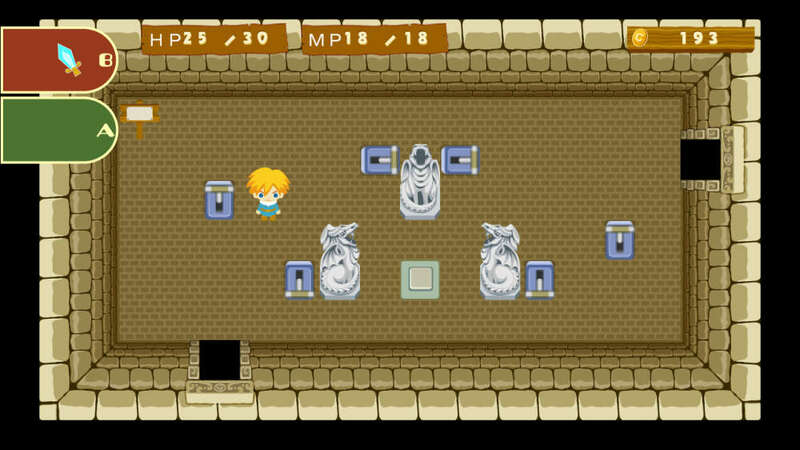 The puzzle types will be immediately familiar to anyone who’s played a top-down Zelda game – hitting switches to move statues into position, throwing pots, finding the right item to open up a new path. Similarly, the combat is very familiar. Swing your sword (upgradable a couple of times to shoot projectiles) at the enemies confined to each room, and equip a secondary item of your choice for a magical effect. There are even winged shoes that allow you to run faster while holding RB. 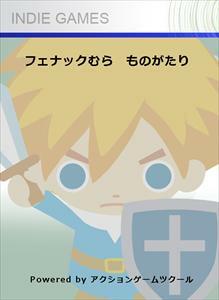 The game’s plot is incomprehensible without knowledge of Japanese, but the gameplay doesn’t suffer for it. Whatever the story is, it’s clearly only a justification for our wannabe-Link protagonist to wander through some dungeons. It doesn’t take long to work out that certain characters heal you and save your game, and none of the puzzles are difficult enough that your inability to read the accompanying signposts will hamper you. I don't care how weak it is, I refuse to shoot you in the eye. FenackStory starts off with a brief stroll through a village, then a couple of introductory dungeons comprising discrete rooms that unLink can pass between but enemies can’t. So far, so Zelda. I was actually having a pretty good time and thinking my 80 MSP had been well spent. After these introductory dungeons, there’s a boss. Like most first bosses, it’s pretty straightforward. Dodge its attacks and hit it until it dies. I came embarrassingly close to dying, but killed it on my first try. That’s fair for a first boss. And this, I’m afraid, is where it all falls apart. I slapped down that first, easy boss and…the credits rolled. The short sequences of rooms populated by weak enemies and simple puzzles were not introductory dungeons. They were the entire game. I expected FenackStory to be short, as an indie game costing less than a box of value bran flakes. What I didn’t expect was for it to last barely longer than it takes me to eat a bowl of the aforementioned milk-sodden brown shards. Play the trial, by all means. It’s pretty fun, if easy. Go on, give it a try. Let me know when you’re done. I think it says-- Oh wait, I used that one. Er...oh look, no chickens! Welcome back. Did you manage to get out of that first short castle dungeon? I know I did. Congratulations, you have completed 50% of the game within the eight minute trial period. Now play the trial again, and this time imagine that at the end you spend a minute or so running left and right to hit a large enemy. Congratulations again; you have now, to all intents and purposes, played the whole of FenackStory. I don’t want to be too hard on this game. It does what it sets out to well enough – it’s a low-grade but fun clone of the old Zeldas. I did have a good time with it. It would be churlish to complain at an 80 MSP game lacking the hours and hours of content you’d find in a real Zelda adventure. There’s no denying, though, that even at this tiny price, a mere 15-20 minutes of play isn’t enough. And that’s including the two or three minutes I spent trying to work out what the items in the shop might do, and then trying them out on enemies. It’s also including some degree of backtracking to make sure I visited every room and opened every chest. Normally I’d comment on the visuals and sound, but there doesn’t seem to be much point. 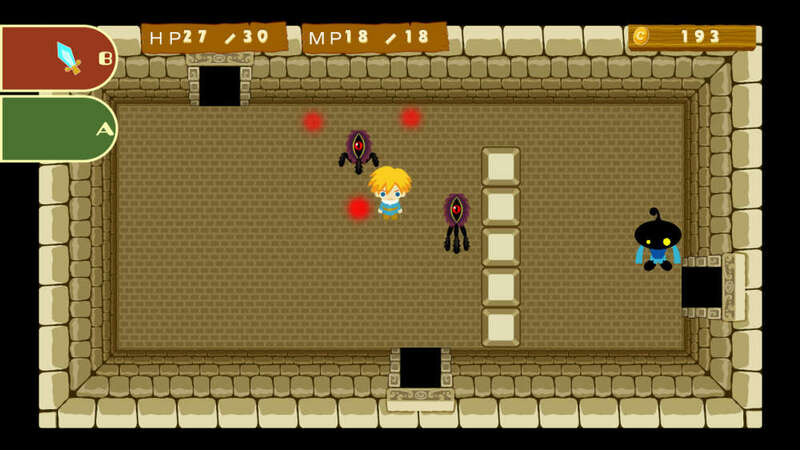 With even just three dungeon-then-boss sequences, FenackStory would be easy to recommend as a cheap, short Zelda-alike. As it is, even 80 MSP seems a bit steep for a game that is barely more than a tutorial level. No wonder he looks annoyed. Those switches are the size of his whole body. I hope he's been hitting the gym lately. I really want to recommend FenackStory, but I can’t in good conscience actually advise anyone to buy it. There just isn’t enough there, and that is a woeful shame. Still, if you have 80 MSP to spare that you’re happy to use for 15 minutes of entertainment, go right ahead. I’d like to think we might be encouraging the developer to make a longer sequel. Certainly the Xbox indie channel needs more of this sort of adventure game – just please, give us some that last a little longer than a more leisurely than average dental brushing.